Every once in a while you hear these studies about how little Americans know about geography. I have always been pretty good at that and I like studying about other places even though I have never yet left Texas. 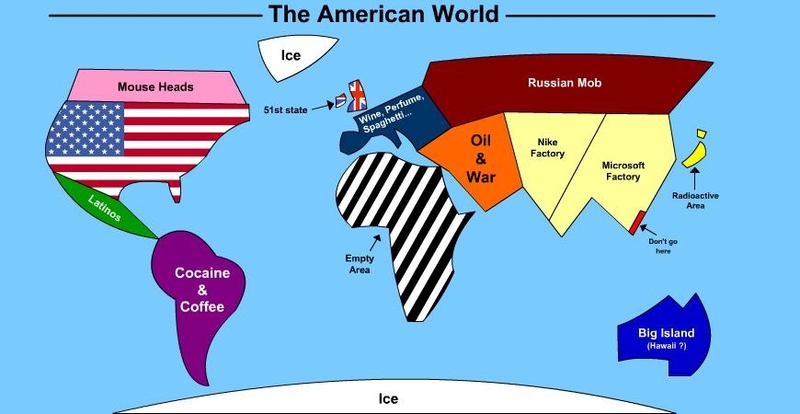 Saw this map the other day and started to wonder if this really IS how Americans see the world. If so, we should all be really worried! There is not enough in the media about the soldiers who died in our war of choice and occupation of Iraq. This tells the story of one of those soldiers in the voice of his wife and his little girl. It might make you cry, but that is a good thing. We need to cry about what is happening here. Like most of my political posts, this is cross-posted at Political Teen Tidbits and at YouThinkLeft.